Step 1: Sponge white (FAB white pictured here) on the muzzle area, making sure to extend the edges to directly underneath the pupil of the eye. Sponge a smaller white “chin” onto the bottom lip and down about 2/3 of the way to the jawline. Sponge pink (Paradise Dark Pink pictured here) beside the eye, about the length and width of a finger. This will make the inside of the ear. Step 2: Sponge grey (Paradise Storm Cloud pictured here) from about halfway down the forehead to halfway down the top of the muzzle, so that the white is very obviously below the grey. Sponge grey in a large “C” shape around the pink areas to create the ears, making sure that they come up above the “head” portion of the koala fur. Step 3: Using a small flat brush like Art Factory 5/8″ angle brush, load a creamy black (Paradise Black pictured here) to make the nose. The creamier black will be easier for removal later. Make sure to start the nose slightly below the inner corner of the eyes and carry it down past the person’s nose, completely covering it and stopping about halfway between the bottom of the nose and the lip. The bottom of the nose should be wider than the top. An echoing line above and to the sides of the nose helps separate the muzzle area from the rest of the face. The bottom lip of the koala should take up the middle 2/3 of the person’s actual lip. Step 4: Finish off the design by adding short furry strokes to the edges of the koala muzzle and face. Make one solid black line on the outside of the pink area to define the ear, and then add lots of white strokes starting from the inside of the pink area. They have a lot of fur here naturally, so don’t be shy with it. You can throw in some small black lines between them to give some depth if you like. And now you have a cute, cuddly, and quick koala! 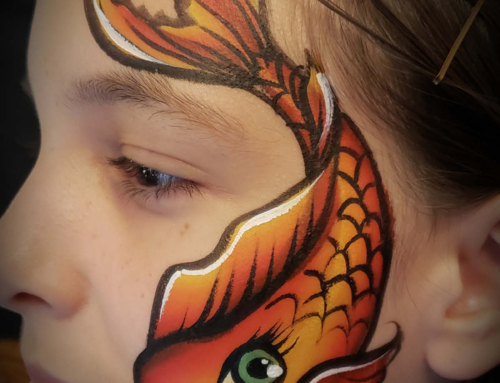 Bethany McLean is an award-winning face painter and body artist, working professionally in the Atlanta area for 13+ years. 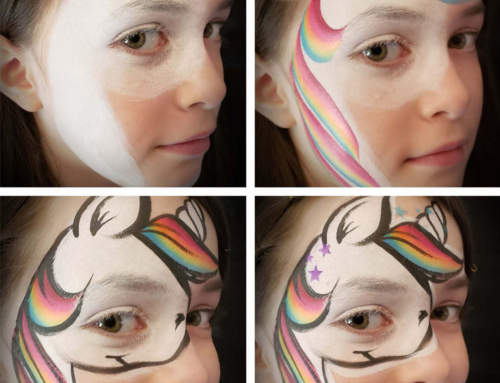 Starting with children’s parties and local events, she has grown her business into a full time career with her work appearing in numerous film and television shows. Her clientele includes Cartoon Network, the Georgia Aquarium, Smirnoff, Q100, 11Alive, The Weather Channel, AMC, Bacardi, 99X, and many more. 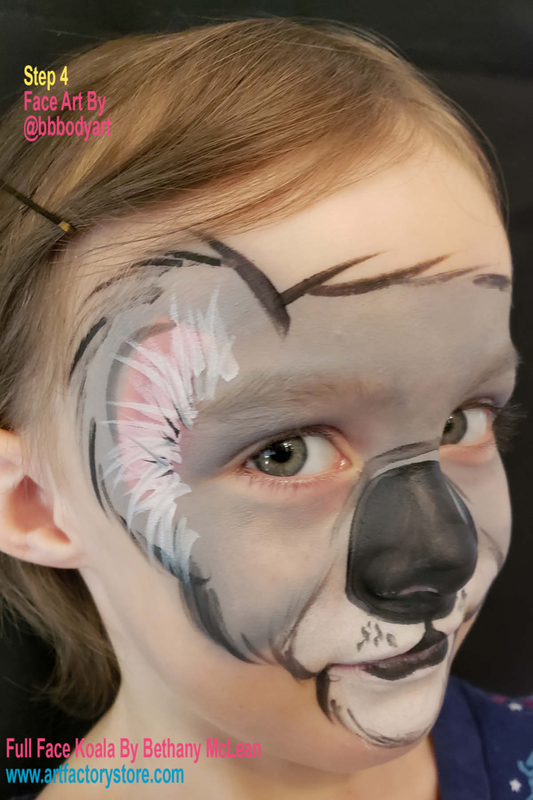 She continues hone her skills, staying on top of pop culture, makeup trends, and new products to keep providing her clients the highest level of service.